Set a year after the events of Batman: Arkham City. With the death of the Joker, the crime rates in Gotham City has significantly declined. However, this also allowed Batman's other enemies to unite against him. Main villains like the Scarecrow, Penguin, Two-Face, Harley Quinn, Riddler, Firefly, and Poison Ivy will join forces with the ultimate goal to kill Batman. Furthermore, he gets a new arch-nemesis, the titular Arkham Knight. 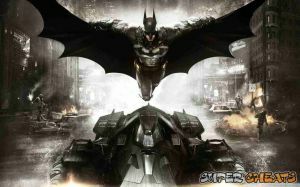 Take control of the Batmobile, and traverse the larger, open-air location of Gotham City. Welcome to SuperCheats' Unofficial guide for the game. Please use the menu on the right to navigate. The game is scheduled to be released on June 2 for the PC, PS4, and Xbox One. i love it i've progressed without no help and look at you punks! No discussions open for Batman: Arkham Knight at the moment.